St. Louis Union Station Hotel, 1820 Market St.
Shutterfest is an annual photography convention in St. Louis, Missouri, held this year on April 23-25, 2019. It is located in a unique venue, the renovated Union Station, a historic train depot and hotel. Speakers and workshops. Lots of opportunity for photo shoots; the models are provided. Register and reserve your hotel room in advance. Visit their website for complete details. The Out of Chicago Spring Photography Conference will happen April 27-28th, 2019, at the College of Lake County, in Grayslake, Illinois. Two dozen photographers from around the country will teach landscape, travel, portraiture, flower, architecture photography and more. Shootout stations will be set up for you. Excursions onsite and to surrounding natural areas. Grayslake is three hours east of Dubuque, between North Chicago and Kenosha. To save $50 off this event, use the code SPRING. For more information visit www.outofchicago.com/spring. Wesley Woods, 10896 Nixon St. The 2019 N4C Spring Mini-Convention will be held on May 3-5, 2019 at Wesley Woods in Indianola, Iowa. 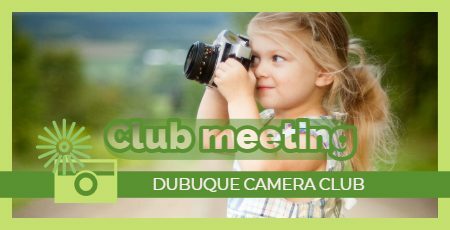 The Dubuque Camera Club will meet on Monday, May 6, 2019 at 6:30 p.m. All tri-state area photography enthusiasts are welcome to attend. Club members, send in your N4C submissions before the meeting. 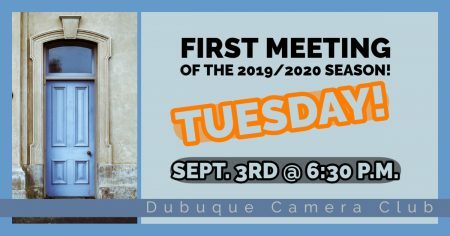 The Dubuque Camera Club will meet on Monday, May 20, 2019 at 6:30 p.m. PHOTO CRITIQUE NIGHT! 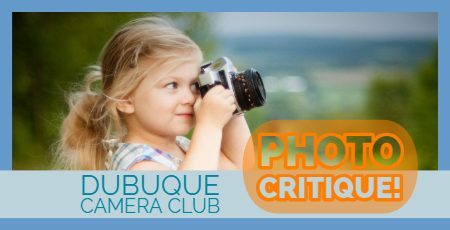 Club members can submit 1 to 3 photos for constructive feedback. More details below. 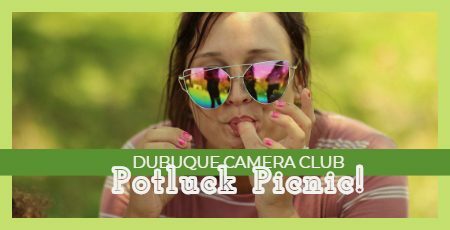 The Dubuque Camera Club will meet on Monday, June 3, 2019 for our end-of-the-season potluck picnic. Open to club members only. Bring family/significant other, along with a dish to share. Members, please watch your email for details. IMPORTANT: Reflections submissions are due before the meeting. Click here for Reflections guidelines. The Iowa State Fair will be held in Des Moines on August 8-18, 2019. The theme is "It's all about the 8's." Photography entry deadline is June 15-16, 2019.